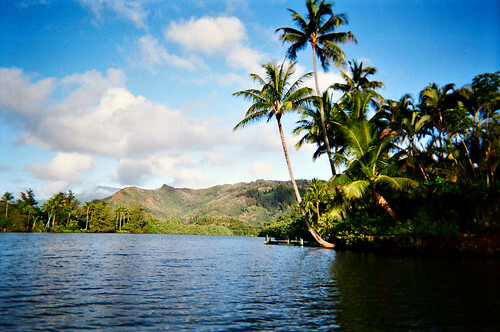 To start, A friend and I decided to go on a vacation to Oahu and Kauai. 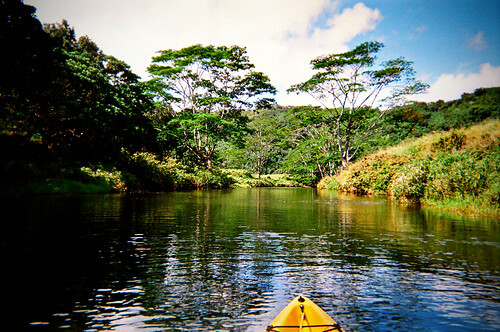 The night before we got to the paddling part on the Wailua river, I took my camera in it's waterproof case out to the reef in Poipu to go snorkel with the fish. I got in the water and started swimming along and to my horror, the waterproof case was very not waterproof all of a sudden. Before I realized what was going on, the housing was full of water. I unbuckled the housing and quickly whipped out the battery and memory card. The camera was DOA and the battery was warm to the touch. I could only hope the SD card would make it when I got home. I saw nothing wrong with the seal at all and I closed it in the hotel where it was clean of sand, so I'm not sure what happened to make it spring a leak, but now I have an odd shaped brick rather than a camera :/. I can only hope I still have a bit of insurance left with the manufacturer. 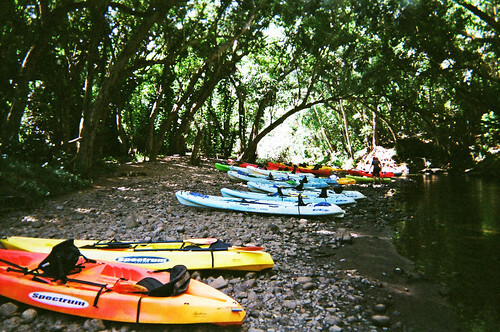 I couldn't go without pics, so I went and got a little disposable for the paddle (sorry about the quality). The thing about Kauai and really all of Hawaii in general is you have to wake up early to beat the crowds of tourists. We hit the water at 7:30 AM and we were on a nice empty river. a little way up the river, there was a small road bridge we could paddle under, so taking our time, we went as far as the little branch would go. just under a click in, the waterway ended with a spectacular view of the mountains past the tall grasses that grew out of the water. The water was really murky even in the shallow areas, so it was pretty hard to guess the depth. I snapped a few pics and we headed back out under the bridge. Now we were surrounded by tour groups. It was about 8:15 when we arrived at the beach to hike to the falls. Every last inch of space was now occupied by tourists. We headed across the bank and changed shoes to hike. The small trail went through a forest that seemed eerily like the west coast. There was a water level indicator with a gradicule that went to over 20 feet. Must be a very wet place in the rainy season. Some of the guides from the tours were murmuring about the place being a muddy pit only a week ago. We got to the falls just before the rest of the tourists showed up. There were lots of signs warning about falling rocks and imminent death from above to swimmers below the falls. I didn't hike a mile to not go in the waterfall, though. So I got in the moderately cold water and went for a swim. 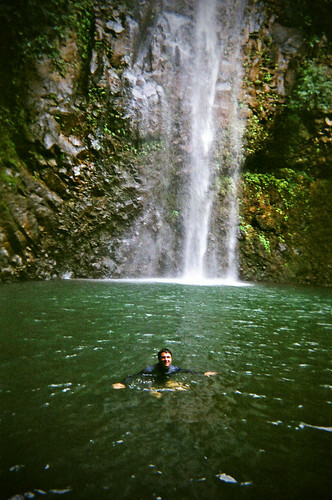 I got a bit more courage and swam near it, but I never got right underneath the falls. I'm glad I didn't die. ;) Once I got out of the water I noticed sort of a uniquely kauai scene: chickens - everywhere. Kauai has a bit of a chicken problem and the tourists contantly feeding them probably isn't helping. At least they're nice looking chicken. They seemed to roam coast to coast and no matter where you are on the island, the silence is interrupted with rooster crowing. We made our way back down to the kayaks and the beach was crammed with the little sit on tops. Oddly most of them were doubles. My friend and I traveled up the river a bit more and I went on to see how far upstream you could get. The river terminates ina set of lazy rapids during the dryer season. Our time was running down - almost 5 straight hours of paddling and hiking. We booked it back to the put in and dealt with the wake from all kinds of power boats on the river. The day just kept getting better and better. 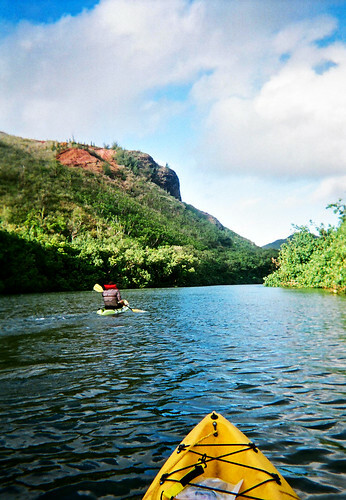 Pleased with our progress on the river we headed to a great pub in Kapa'a called Pau Hana's Bar and Grill. The restaurant was a small sports bar with some cool hot rod and Harley paraphernalia. The bartender came over and handed us a guest-book and explained the story behind all these bills pinned to the ceiling. It was quick and tasty food with a couple friendly folks on staff. A good way to fuel up for surfing later on at our spot just past Kapa'a. Life is good.